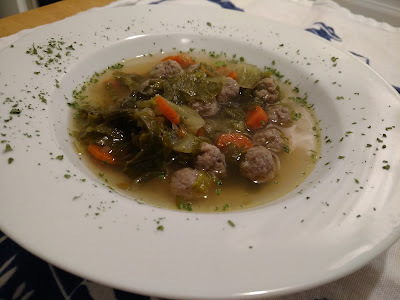 Let me start out by saying that this was supposed to be Italian Wedding Soup with Sausage Meatballs and Kale but I am so over Kale. It is a garnish! Unless it is the Lacinato Kale. That I like. I am more of an Escarole person. This recipe is from Adventures in Slow Cooking by Sara DiGregoria. I got this book for Christmas. Lots of recipes in it!! The best part of this dinner was the broth! It was from the batch I made on Saturday. Just delicious. I would like to thank Chris for handling the food styling for the photos. Would like to write more but we are getting a bomb cyclone tomorrow. Not sure what to expect.